Aspire Systems forms alliances with Magento to help Retailers deliver superior Ecommerce Customer Experience (CX). DALLAS, TEXAS, USA, March 7, 2019 /EINPresswire.com/ -- Global Technology Services firm, Aspire Systems, announces its partnership with Magento. 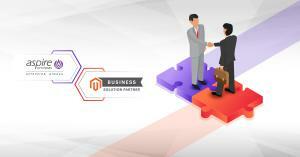 Magento, an Adobe company, is a leading open-source ecommerce platform enabler. Every enterprise starts off with a vision and the ecommerce sector is no different. Well Magento Commerce Cloud has out-of-the-box solutions which entertain customizations and seamless third party integrations. “Our past experience along with this partnership will help us scale new heights in terms of what we can offer to the client not only from an ecommerce platform perspective but also from their OMS and Business Intelligence Pro. Experience in these products will help in strengthening our Digital Retail offering and in providing a wider product choice to our customer while we consult on their End-to-End retail framework”, adds Finny. In addition, when looking at digital transformation from a 360° view, it is important to have a unified platform that can help in integrating your ecommerce applications. With Aspire’s Magento certified experts, Magento implementation and support will bring out quality integration, testing approaches with intelligent bug fixes and development approaches that can take ecommerce services to a totally different level. This partnership will play a vital role in helping retailers achieve unified commerce in the coming years. Aspire Systems is a global technology services firm serving as a trusted technology partner for its customers. The company nurtures an array of technological services like Enterprise Integration, Digital Services, Software Engineering, Testing and Infrastructure support for the Retail Industry. The company currently has over 2700 employees and 150+ customers globally and is CMMI Level 3 certified. Aspire Systems is located across the globe including USA, Mexico, UK, India, Singapore, Middle East, Asia-Pacific and Europe. For the ninth time in a row, Aspire has been selected as one of India's 'Best Companies to Work For' by the Great Place to Work® Institute, in partnership with The Economic Times.